Capcom’s thunderous call to arms has been heard. Nearing 2.5 million sales in Japan alone, Monster Hunter 4 Ultimate embarks on a journey to western shores at a time where it largely remains the most buoyant property that the company has. But while the Monster Hunter series can always seemingly rely on the Land of the Rising Sun to spur their fortune, it hasn’t yet managed to strike similar success overseas. 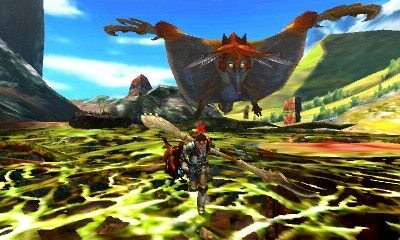 We can hope that Monster Hunter 4 Ultimate begins to sway the tide, an unrelentingly comprehensive quest that has been perfectly balanced to be approachable to newcomers and seasoned Hunters alike. Gracefully sailing across sand dunes aboard a skiff, the Nintendo 3DS exclusive’s more narrative-driven aspirations are witnessed from the outset. When a Dah’ren Mohran rudely interrupts your otherwise quaint voyage toward Val Habar, you immediately put your life on the line to sway the elder dragon from endangering those at the unsuspecting bazaar. Victory is unavoidable, but your steely resolve in dealing with the situation catches the eye of the Caravaneer who enlists you to his merry band as a rookie Hunter. He’s looking to uncover the mystery behind the Article, an item that he carries that otherwise justifies Capcom allowing you to travel far and wide throughout Monster Hunter’s expansive world. 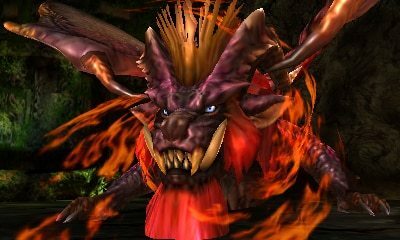 This allows Monster Hunter 4 Ultimate to relinquish binding players to a single hub village, instead seeing you steadily journey away from Val Habar to experience Harth’s fiery depths, the sandy beaches at Cheeko Sands and beyond. Each are burdened by their own monster-related woes, and it can at least be said that your Hunter will never be out of work. Entwined around that is a party of Ace Hunters tasked by the Guild to pursue Gore Magala, a gargantuan wyvern who is infecting hunters and monsters alike with “Frenzy” that they are looking to neutralise. Your adventures repeatedly become a triumph over adversity, players approaching the Guildmarm to accept any quests slapped on the board. These, more often than not, will see you on the hunt for a monstrously oversized creature, but are diversified by others that challenge you to safely capture monsters, gather materials, catch fish or survive a designated time. Completion can be achieved by either accomplishing the main objective or sub-quest, when available. And while time limits are broadly posited at 50 minutes, you can expect to complete most standard quests within 15 minutes – suiting the game’s portable nature. Confrontations with monsters continue to be a merciless dance with death, taking time to understand their attack patterns and behaviour before lungeing in for successive strikes. New strategies will always be open to you, not least in part to Monster Hunter 4 Ultimate’s extensive weapon arsenal but also due to the thriving ecosystem behind the entire experience. With monsters never displaying their remaining health, you will instead look for subtleties in their painstaking animations that see them enraged ahead of defeat or wearily limping away from battle. Their attacks may risk disturbing nearby monsters, who will join the fray and see you fending for your own survival on multiple sides. You’ll increasingly come across “Frenzy” as your quest progresses, the Gore Magala spreading it to other monsters that frequent the areas that you wander. This makes their stance far more aggressive, but places the player at risk as the infection can be passed to you. This makes a bar appear on-screen that slowly fills as you succumb to its effects, heightening the damage that you suffer from attacks if allowed to become full. Attacking monsters will allow you to make it deplete, and if emptied it will temporarily boost your Affinity. Suffering from poison or burns can be an annoyance – worsened by Capcom always making your Hunter strike a stoic pose whenever they gulp a potion or remedy – but the risk vs. reward mechanic behind “Frenzy” is far more adaptive. Combat continues to cater to differing styles of play through presenting players with 14 weapon types. You can experiment with each through arena tutorials, noting which you don’t particularly enjoy against those that you’d be eager to leap into battle with. There are two entirely new additions in the Insect Glaive and Charge Blade, the first equipping Hunters with a martial arts staff and an accompanying Kinsect. This beetle-like contraption can harvest red, white, orange and green coloured extracts from monsters, leveraging temporary boosts that increase your attack power, speed, knock back protection or health recovery respectively. As someone that enjoyed the thrill of swinging Monster Hunter Tri’s Switch Axe, the Charge Blade was a more natural progression to my own flair for combat. This similarly allows you to quickly switch between two weapon modes, whether that be the stoically defensive Sword and Shield or meatier Axe. Strikes with the Sword will generate energy that is bottled in phials, which you can then release as an Amped Element Discharge when using the Axe form to significantly damage your prey. Making camera orientation far easier in the midst of combat is the new Target Cam, allowing you to lock-on to larger monsters to then centre the camera on it whenever you wish by tapping the L Button. This is enormously beneficial, allowing you to always keep an eye on your monstrous foe and what attack it may be preparing to perform. Those investing in a New Nintendo 3DS / 3DS XL will also enjoy the benefit that the C-Stick provides, emulating the Circle Pad Pro and allowing you an even greater degree of control over camera movement. Verticality has been Monster Hunter 4 Ultimate’s buzz word, but it remarkably freshens your approach and how your continual battle will pan out. There are far more opportunities to scale walls, catching your prey unaware as you strike them from high above. Make them flinch and you can mount them, a gritty mini-game ensuing where you must hold on as it tries to shake you off before brutally carving away at its hide. That’s presumably why the environments that you trawl are notably more scalable, necessitating you slowly clambering up them but also opening up area transitions where you can gleefully leap into lower caverns. They’re still clearly numbered on your map for reference, always displayed on the touch screen, and paintballs are just as important in allowing you to track where a monster has specifically fled to. Another noteworthy addition are Expeditions, single player instances that set you on an adventure to explore the Everwood. The brilliance of these is that you have no map for guidance nor any idea what monsters will be lurking in each area, although the critters are drawn from those that you have already defeated. You can either choose to fight everything in your path for additional materials for the game’s intensive weapon and armour crafting, or you can make a run for the wagon awaiting you at the other end – rewarding you with benefits and perks. Online multiplayer, which was absent in Monster Hunter 3 Ultimate on Nintendo 3DS, is now present, which is an enormous plus for those that can’t as readily get together locally will be a huge draw this time around. You can search for Gathering Halls online, either through your Friends List or the game’s Hunter Search, with the only negative to the experience being restricted to only using text chat. Although, those choosing to adventure alone shouldn’t be worried that they will be at a disadvantage, with customisable Palicoes joining you on your quest. Guild Cards that detail your progress can be shared by StreetPass, while an enviable amount of downloadable content will be distributed over the coming months to wholly extend your Hunter’s career. Multiple Nintendo and Capcom properties have all seen crossovers, and I certainly can’t wait to secure the undeniably unique armour sets.